This page is a collection of Olympus Evolt E30 tips, tricks, techniques, camera settings and hacks by users and owners that I’ve across in forums, online communities, blogs and related websites. Full attribution is given by linking to the source and where available, the author’s homepage or photo gallery. Reduced the sound of Image stabilizer operations when IMAGER AF and HYBRID AF are being used. Resolved the issue where pressing the delete button in Close-up playback occasionally caused the Card access lamp to blink. Resolved the issue where images with a changed aspect ratio played back with Index display sometimes had horizontal stripes. The firmware update needs to be performed using either the Olympus Master or Olympus Studio software. Refer to the Olympus Firmware Updates page for the details. The E-30 allows you to place, or hold an FL-50R or FL-36R electronic flash away from the camera’s accessory hotshoe. Triggering and metering with the flash is handled via two-way communications using light pulses from the pop-up flash. 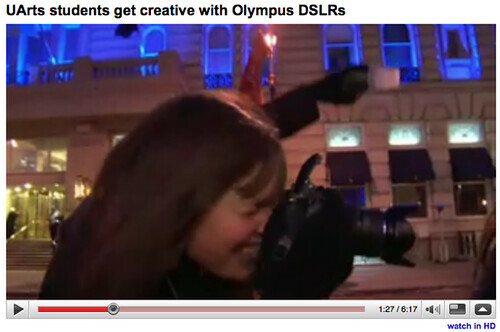 Click the thumbnail below to view the video clip “UArts students get creative with Olympus DSLRs” on YouTube. This footage should give you an idea how the RC flash system works.